In NZ we’ve just observed the centenary of the battle of Gallipoli, where ANZAC troops fought for the British empire. On Anzac Day I watched the movie “War horse”. It bought a lump to my throat and made me think of our own horses. Of the thousands of horses shipped off to war from New Zealand, only a horse called Bess came back. There were lots of tears by those men over their horses, and I know the Lord understands. When Jesus returns as the King, he will be on his own warhorse, at the head of his army. It paws fiercely, rejoicing in its strength, and charges into the fray. The quiver rattles against its side, along with the flashing spear and lance. In frenzied excitement it eats up the ground; it cannot stand still when the trumpet sounds. At the blast of the trumpet it snorts, ‘Aha!’ It catches the scent of battle from afar, the shout of commanders and the battle cry. There will be horses in the Millennial Kingdom. You will hear the sound of their bells as they trot, and on their bells will be the inscription “holy to the Lord.” Holy means “whole”. When Jesus reigns in his kingdom, all will be made whole. But be aware that before the second coming, we will be hearing the hoof beats of the first horseman of the Apocalypse – the rider on the white horse who is given a bow and told to conquer. Just remember – that’s not Jesus. It will be Apollyon (the destroyer) imitating him. Take heed that no man deceive you. For many shall come in my Name, saying, I am Christ, and shall deceive many. At that time if anyone says to you, ‘Look, here is the Messiah!’ or, ‘There he is!’ do not believe it. For false messiahs and false prophets will appear and perform great signs and wonders to deceive, if possible, even the elect. See, I have told you ahead of time. Jesus will come like a thief in the night for the Church; an event as sudden as lightning. 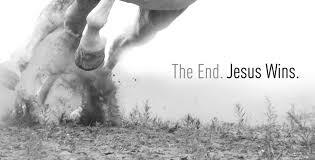 After that He will return at the end of Tribulation on his white horse, for all to see.